Living in a tiny house usually involves spending a lot of time outside the house. This is especially so for those who work from home and finding a space to work can present challenges. A lot of people use coffee houses and other public spaces convenient to sit with a laptop, but there are a lot of situations that require a bit of space to spread out or use resources that require a more permanent setup. At the Tiny House Jamboree 2017 in Arlington, I had the opportunity to listen to Justin Nygren present just how cohesive the two ideas, Tiny living and Coworking spaces, really are. His passion for building communities got him involved with intentional living communities for over 20 years. He also started an arts organization that mentors and supports artists, before he created The Grove. The Grove is a space in Dallas where small businesses, independent workers and small organizations could find the resources to thrive and grow. This is where the worlds collide, Coworking is about community and providing resources for people transitioning into a new lifestyle and possibly nomadic living. It was at The Grove where Justin met Beth Norrgard. Beth had recently decided to shift into the tiny house life and found the connections she needed to put the finishing touches on her tiny house. 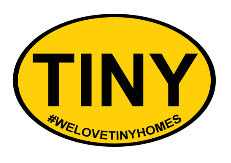 Beth is now a founding member of the DFW Tiny House Enthusiasts, a group that shares knowledge and skills with everyone interested in tiny living. The presentation was called “The Minimalist and the Future of Work” and focused on trends in society, the workforce and the evolution of space. There are many reasons that the tiny house movement is steadily growing and this is an in-depth look at some of the broader ideas that make a lot of sense. Over the last couple hundred years, there has been a population surge and shift from rural living to city centric type of living. As the settlements became towns and towns became cities, people have been clustering more within the urban fabric. The cities that sprang out of the industrial revolution created suburbs after the world wars, those homogenized communities that we all know and love. Now, in many cities across the country, we are seeing a growing number of residential households returning back to the urban core. The model of standard corporate work structures is rapidly changing. A growing percentage of the workforce is not employed at a regular job. There are more independent contractors, people who work from home and independent freelancers taking over these old jobs. Corporations, by hiring out the work, can remove themselves from the responsibility of providing benefits and taking care of employees. For graphic design, coders, startups, developers, bloggers and countless other freelancers, finding the resources needed to navigate whatever kind of work that needs to be done, apart from these larger structures can be a challenge. Virtual Business Partners are people who have stepped out of the corporate world and help startups in the growth phase who don’t want to give up control of the company. For a retainer fee and some long-term equity in the company, a CTO (Chief Technology Officer) will be available to set milestones and help the company achieve them as well as build the teams that will replace the virtual CTO. Those independent workers wanting to work with larger companies have a couple of great resources at contently.com for content development and gocatalant.com for finding larger projects that are in need of your skillsets as an independent contractor or freelancer. We live in an increasingly shared economy, where individuals are able to borrow or rent assets owned by someone else. The Intentional Communities that are springing up with the tiny house movement allows people to be a part of tightly-knit communities, where finding emotional support or help with a build or just having the deep and meaningful relationships that help us be who we are. There are people making intentional decisions to put themselves in careers that allow them to live anywhere they want at any time, known as Digital Nomads. This is part of a cultural shift towards mobility and right where Coworking spaces come in: Collaborative communities where shared offices, good coffee and connectedness facilitate business growth. Coworking began as a way to takes the load off of one person and split it among several people. They each cosign on a lease and split the expenses, formalizing working relationships while remaining independent businesses. Coworking spaces as a business model provides basic office equipment and office space for a membership fee, prorated depending on how much access was needed. From basic desk space to private offices, Coworking provides members with the traditional amenities they would find in a normal business, with the freedom to run their own business and the opportunity to connect with more human resources, typically on a month to month basis. WeWork is a large Coworking company with the motto: “Reintroducing face-to-face collaboration, inspiration, and generosity into our global network of spaces every day.” They have the largest collection of Coworking spaces in the world. WeWork spaces don’t yet consistently seem to provide as high a level of relationship building community that can be found at smaller independent spaces, but they are a global network that grants members access at locations all around the world. That is very convenient for people with mobile lifestyles. Most recently, there is a trend now into niche spaces. In Dallas, there is a space called Weld which focuses specifically on creatives and also Dallas Maker Space which gives access to 3D printers and tools all for a monthly membership fee. What all this means is that society is changing to facilitate more connectedness even as mobility continues to be a growing trend and traditional resources for business are becoming more readily available to the freelancer.